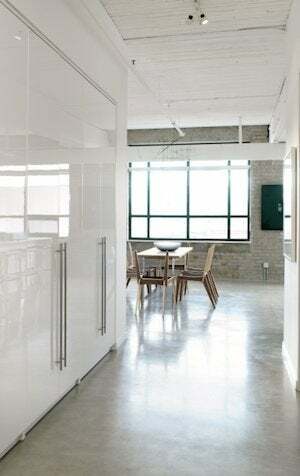 Sleek, shiny, and easy to maintain, polished concrete is a great flooring choice, particularly for modern interiors. If you'd like to create this look in your own home, here are the basics on the polishing process. I am living in Spain and redoing an old house in the country. I’d like some of the floors to be polished concrete. Can anyone tell me how to do this? It’s no wonder that homeowners have adopted polished concrete floors. They’re quick to install and don’t cost a lot. They also wear well and require minimal maintenance. Years ago, you’d see polished concrete only in public spaces—at the mall, say, or in office building lobbies—but nowadays it’s a common sight in private residences. To polish concrete the do-it-yourself way, you’re going to need a concrete grinder. If you can’t borrow one from a friend in the trade, you can rent one from your local home improvement center. In addition, you’ll have to get your hands on an assortment of grinding discs (in a wide variety of grits, from 30 to 3,000) as well as polishing pads. Polishing concrete bears some similarities to sanding a hardwood floor. One of the big differences, however, is that with concrete you are going to make many more passes with the grinder than you would with a sander on a wood floor of a similar size. Also, you should expect to spray on a densifier or hardener between passes with the grinder. Near the end of the polishing process, swap out the grinding disc in favor of a burnishing pad. At this point, you’ll notice the floor starting to get really smooth. Before burnishing one last time, put a thin coat of concrete sealer over the floor. The result will be a stone-like surface that gleams without the aid of floor waxes or oils. The best concrete grinders typically include a skirt and a vacuum, both of which are designed to contain dust. Look for a unit that is also equipped with a built-in liquid dispenser. To polish concrete near existing walls without causing damage, it’s best to use a specialized edging machine (another tool you can rent from the home center). Renting a concrete grinder can be a little pricey—as much as $1,000 per week for the grinder itself, plus $250 per week for the edging polisher. That being the case, if you have a small job on your hands the most cost-effective option might be to hire a professional, as counterintuitive as that may seem. I recommend gathering estimates from a few local crews, then comparing those quotes to the amount charged by the tool rental depot. Bob Vila's "April Showers" Give-Away from Delta Faucet!